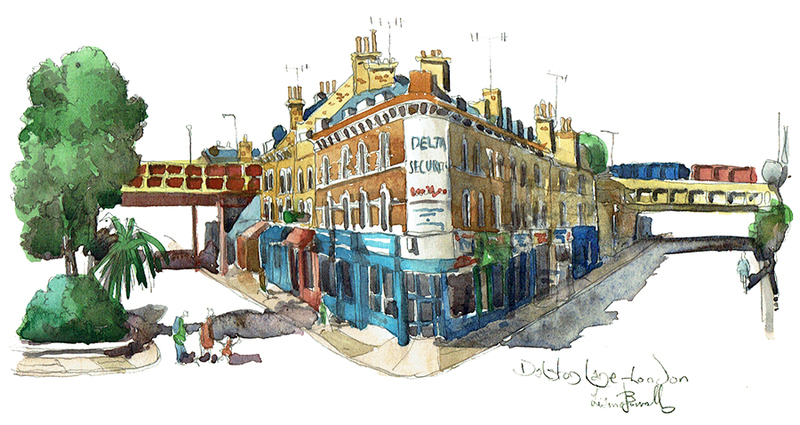 Sign up to my newsletter and you can enter the free draw to win this original preparatory painting worth £160 of Dalston Lane, Hackney, London. This watercolour study is 23cm x 13cm, signed and mounted on acid-free card. The newsletter will be sent out on the 27 April 2017. I look forward to your sign up in the box on this page. I used to live in Hackney in the East, and I was always admired this triangular junction near Hackney Downs train station with the railway bridge cutting through both roads at the far end. It is a proper East end scene and the hand painted signage makes it all the more enjoyable. It was tricky to paint, however, as I had to move about a very busy road junction while I worked. Hackney can be a tough area too, so every couple of minutes car drivers would bellow and hoot at each other for perceived transgressions. One even ended up in a road fight. Everyone was blowing their horns then. Delaying a journey in London is a serious offence. Love everything about the East End that you paint Liam….my whole early adult life was spent here and I’ve been in the USA now for 37 years but can’t ever forget the East End and my roots. Ahh great, glad you like them. i lived may years in the East end too. Its a great place to paint, it just keeps giving. Hackney Downs is all different now. Especially the house prices!